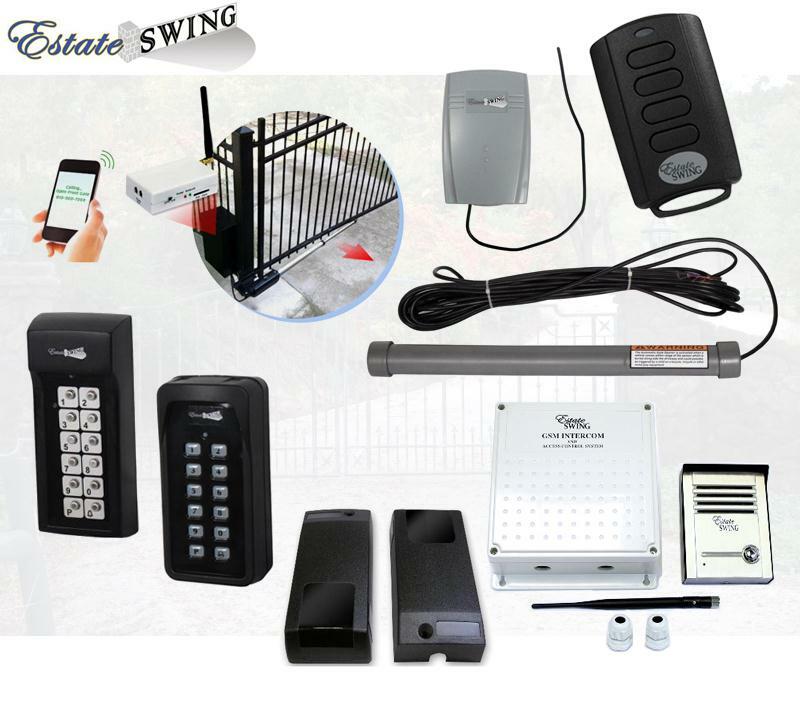 Estate Swing gate openers support accessories for greater access, safety and convenience. As an add-on to the system, gate opener accessories are more than transmitter remotes; they are helpful tools to enhance access, save time, boast safety and prevent unauthorized entry. Estate Swing works directly with manufacturers to develop accessories that bring new features to the market. GSM receiver - dial the receiver number and through caller ID the receiver will recognize the programmed number(s) and open the gate. Holds up to 64 cell or land line numbers. GSM intercom – akin to the GSM receiver in functionality, the intercom version comes with a reception box that a guest can call the resident from. Up to 1,000 authorized users can open the gate via cell phone. 433 MHz Wireless 4-Channel Gate Opener Access Digital Keypad – LED illuminated keypads with a 200+ foot wireless signal, completely weatherproof and require no hood or cover from the elements. Control up to four devices with a single keypad. Available in residential and commercial housing. Wireless Safety Photo Eyes – easy to install wireless photo eyes sense obstructions and halt gate movement. Safety system acts to protect people, pets and cars. Remote Transmitters – compatible with Estate Swing openers (as well as other popular brands) this compact style remote has an attached visor clip and easy dip switch programming. Automatic Exit Wand – compatible with Estate Swing openers (as well as other popular brands) this exit wand opens gate automatically for exiting cars. Gets buried parallel to the driveway, not under it, for easy install. Additional gate opener accessories and parts support the Estate Swing brand. These include products like internal positive stops, limit switch kit and gate brackets. Accessory products (and parts) may be purchased from an authorized Estate Swing dealer.